This is a mug based on a late 13th century baluster jug produced in the Laverstock kilns near Salisbury (Salisbury museum website). 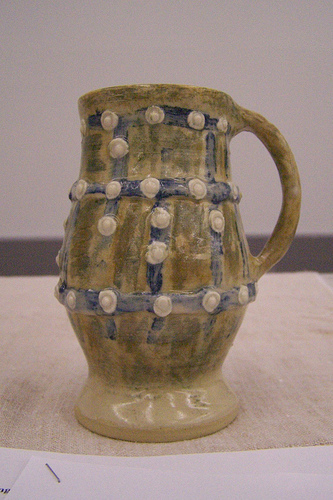 This was a commonly made item and many objects from this kiln have been found throughout Southern England. Local light coloured clay would have been used to make the pots. The regular shape and the production of vast quantities (Salisbury museum website) implies that they were wheel thrown. 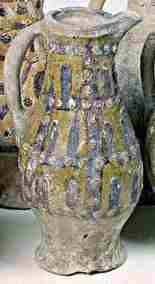 The pots were decorated with oxides. Blue would have probably been cobalt, and since the glaze was a tin and lead based glaze (A Spectroscopic Survey Of English And Continental Medieval Glazed Pottery, pg 1144) and the purple would have been produced by manganese dioxide (The Potters Dictionary of Materials and Techniques, pg 235). The pots were fired in a fuel burning kiln probably wood or coal, as these were the most common fuels at the time, which usually resulted in a reducing atmosphere. These pots were probably fired twice, once to bisque and then glazed with the lead-tin mixture and fired a second time. The pot that I made was fired in and electric kiln that fires in an oxidation atmosphere because that was what was available. To product the same colours a mix of yellow and green underglaze was used to achieve the coloured background, and cobalt slip was used for the blue. The pot was then glazed with a clear glaze to give the shine that the lead glaze imparted to the original. 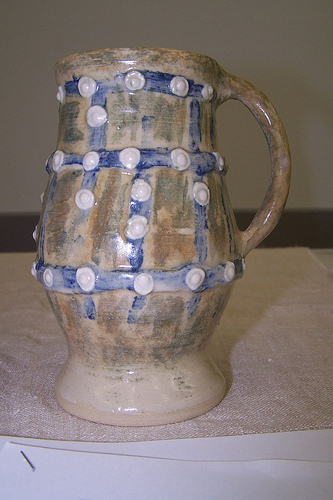 Lead glaze was not used because it is toxic. I would apply the under glazes and slip in a different order, and I would also like to try a chemically created reduction firing with a tin based glaze with oxides to see if it would give the same results as a tin-lead glaze. Thomas L.C., and Musty J.W.G., “A Spectroscopic Survey Of English And Continental Medieval Glazed Pottery”, Nature 192 (480): 1143-1144, 1961.